The Racing Horse is a huge fan of Oliver Sherwood as a person and a racehorse trainer and he has kindly given us two horses to follow for this season and we invite our members to share their progress. He reminded me that he has a lot of nice youngsters this season and last seasons bumper horses all schooled well, but his pick are Sevarano and Manning Estate. Our thanks to Oliver. At this moment in time we cannot be sure what his optimum ground and trip are. We do know Shantou was a top-class 12-14f performer who won the St Leger. Shantou won on good to firm ground to soft ground so versatile.He is a high-class jumps sire and one of his progeny include Briar Hill. This one acted on yielding to soft to soft to heavy but optimum ground was probably soft. 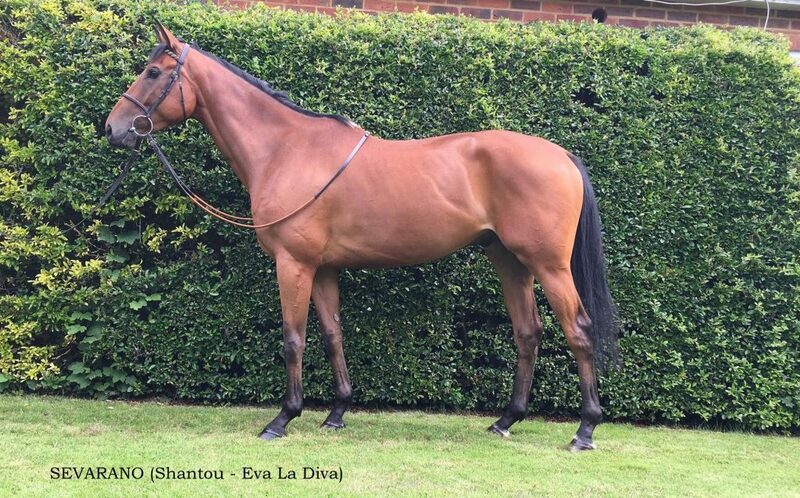 The dam of Sevarano is Eva La Diva and she came from a good Flat family though she showed little in her racing career running three times in NHF races on good ground finishing 324. Her sire Azamour was a fast ground horse and her dam was Spanker and she raced on the AW and good ground over 1m4f trips without winning. Up to now breeding has given us conflicting information as to optimum conditions but last February Sevarano ran at Kempton in a NHF 2m race in soft ground and bolted up! He came away readily in the final furlong under hands-and-heels riding and looking a useful recruit in the process. He is tall and looks well and there is no doubt he will make a jumper. After that win Oliver told us: "I have always liked Sevarano, he's always done it very easily at home but I've been in the game long enough to know at doesn't always work out on the course. He did it really impressively beating some nice horses and we will be going hurdling next year though he's probably a chaser in the making. He's going the right way and I like him." 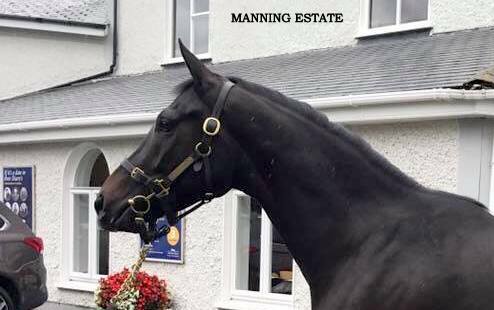 MANNING ESTATE is a 4yo gelding out of Stowaway and Specifiedrisk (Turtle Island). and owned by Mr & Mrs Norman. Stowaway is a high-class middle distance horse at 3-4 winning 4 of his 6 races on fast ground. He died in 2015 aged 21. He is a sire of NH winners including Champagne Fever and we are reminded he won on good ground but his other 9 wins were on softer to heavy. We have no record of the dam racing but her most successful offspring Glencove Marina won 2-2 on good ground but the other 6 wins were on yielding to heavy ground. The damsire Turtle Island was a top-class 2yo miler and loved soft ground and is a dual-purpose sire. Given the above we are not sure what the optimum ground is for Manning Estate. He has only the one run so far in a NHF Class 5 race at Fontwell on good ground over 2m2f. It was only a lack of experience that just held him back close home as the more streetwise winner asserted, but the half-brother to Grade 1 scorer Glencove Marina and this year's Topham Chase third Theatre Territory posted a highly encouraging opening effort nevertheless and certainly has one of these in him. Hankering for another Cheltenham Winner! Last season saw him in 51st position where he returned 21 winners from 222 runners for 9% but The Racing Horse feels the good vibes coming out of Rhonehurst and feel certain he will do better this season. This week he told us the has a "lot of nice youngsters this season and last seasons bumper horses all schooled well." So far this year he has raced 28 of his charges of which 7 have won a race. The 8yo gelding The Fresh Prince is his highest rated winner (RPR 128) and won recently for Trevor Hemmings (now with the Rhonehurst Raiders) and he could easily follow up. The win was in a 2m4f Handicap Chase (Class 4) at Plumpton and he might have improved since a wind operation. Representing the trainer at the track Leighton Aspell told us: "He hasn't achieved what we thought, but he's won a race every year and hopefully he might go on from this." He has an entry at Southwell on Sunday up in class but will only carry 10st 10lbs. So what courses does Oliver prefer? He does best at Newbury and shows 62 winners from 331 runners for a 19% strike-rate and a small level-stake loss to SP of -1.37pts. We know he excels with chasers and records 27-119 for 23% (+16.23pts) at the same course. When he sends a chaser to Fakenham we take notice, he scores heavily with 16-41 for 39% (+21.90pts). Figures from 1988 to August 2018. Since he started training in 1988 his best three individual months were in November see 1989 (15-35 for 43%), 1990 (15-46 for 33%) and 1994 (12-41 for 29%). He obviously gets them to a peak at that time because he best two months in the last five years has also been in November where 2014 showed (7-31 for 23% and 2015 (6-36 for 17%). Given his modus operandi the trainer does not usually have a winner until around October but he is 1-1 for August 2018 and looks likely to score again in the coming month with Captain Peacock (won at 14/1). He came from the Flat so perhaps it's no surprise that he proved better suited by the less testing ground on his handicap debut over hurdles at Bangor, and this was a marked improvement on what's gone before. He got as high as 90 on Flat RPRs when with William Knight so it is not hard to make the case for further improvement. Speaking to Tarnya today she told us: "I think Sevarano and Manning will handle most types of ground although Manning Estate has more of a floating action so he might not handle heavy ground yet. Both horses schooled well yesterday and will probably jump the hurdles on the all weather next week." Oliver later confirmed: "We’ve got a really exciting bunch of youngsters to run this season and after a couple of years of rebuilding we have more strength in depth. I have a relatively small team compared to most of the top jumps trainers with only 60 horses but I know each and every one of them and they are all treated as individuals with most of them going out in the paddocks every day. I don’t want to expand but I just want to increase the quality each year."